MTA, a company known for the development and production of a wide range of electromechanical and electronic products for major OEMs, announces at Agritechnica 2017 the beginning of the collaboration with Mecalac, a major producer of compact class construction equipment, thanks to the delivery of its Spot off-the-shelf dashboard. The Spot dashboard has been chosen by the French multinational to equip a new Mecalac Site Dumper to be launched at the end of 2017. Spot dashboard has a compact circular dimension of just 106 mm diameter and an IP66 rating for protection, making it ideal for off-highway applications on compact vehicles. The Spot dashboard has a central dot matrix LCD (160 x 56 pixels) with configurable tell-tale lights where required. 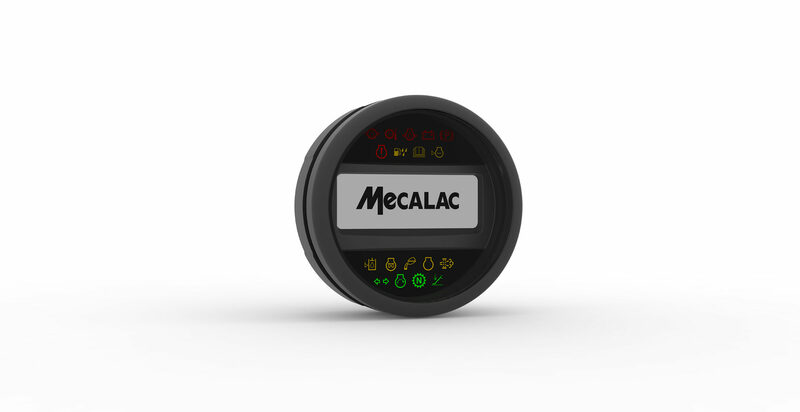 The strength of Spot dashboard is the proprietary MTA Studio software tool, that enabled Mecalac to customize Spot dashboard to meet fast changing production needs without delay or costly software re-writes. MTA Studio, which is the easiest solution for off-highway OEMs needing customizable off-the-shelf dashboards and displays, allows for full dashboard configuration both in graphics and operating logics using programs written in C/C++, Functional Block Diagram (FBD), and LADDER. The graphic Human to Machine Interface is What You See Is What You Get, allowing the programmer to see the graphics on the PC as they will appear on the dashboard/display, while building the application itself. The software also contains a real-time debugger and a number of libraries with various available functions the customer can choose to integrate, depending on application needs. Spot belongs to the increasingly range of MTA’s dashboards and displays configurable with MTA Studio Software. These products have hardware and software architectures that are very similar, but with a range of looks, sizes, numbers of LEDs, inputs and outputs, as well as different screen types to meet the needs of the off-highway world. The electronic products currently developed with MTA Studio consist in 6 dashboards and 4 displays, all part of a standard range that is always available and constantly expanded. It is noteworthy that 3 displays can be configured not only with MTA Studio, but also with an Android environment for more powerful graphics. The offer is completed by Dyna and Actua, 2 actuator control modules with basic and advanced connectivity respectively.